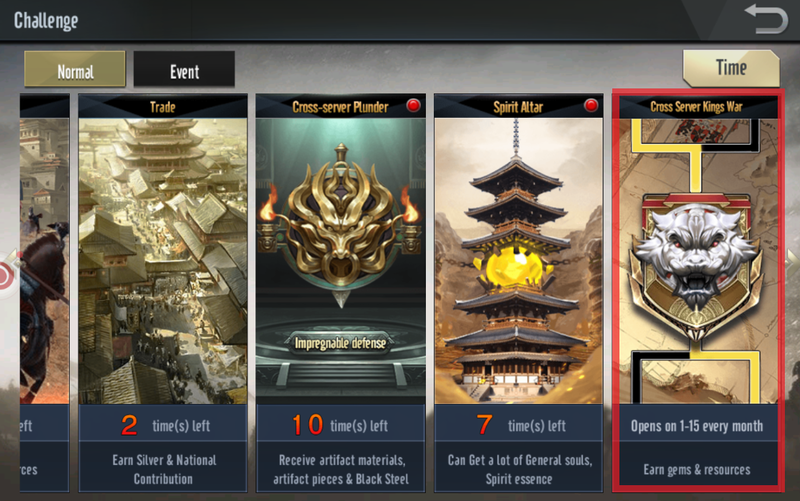 Lord reach Lv 60 to register in Cross-server Kings War and Lv 30 to watch battle. Every month from 1st day to 15th day is open time, the rest is break time. 5:00 1st day to 5:00 3rd day is registration time. 22:00 - 22:40 3rd day to 9th day is Elimination. 22:00 - 22:30 10th day to 15th day is Promotion. Or in the main castle, lords click “Challenge” to join. Time: 17rd day to 23th day each month, 22:00 - 22:40 is Elimination. - Upon registered, default Elimination point is 1000 and will change after battles. - During Elimination, 5 players will be matched based on power. Win ⅔ battle to claim the victory. Battle 1 is defense, battle 2 is attack, battle 3 is random. - Point will rise upon victory, or reduce when defeated. - In Elimination, first 10 battles are ranking battles, all are [Novice]. After that, ranks are divided into [Bronze], [Silver], [Gold], [Platinum], [Diamond], [God of War]. - Upon Elimination ended, TOP 64 will advance into Promotion. - 22:00 - 22:30 24th day to 29th day is Promotion. TOP 64 will be matched randomly at 23:00 on 24th day. - When Promotion started, each pair battles 5 times, win 3 to claim victory. Fít 4 battles: 2 attack, 2 defense. The last battle is random. 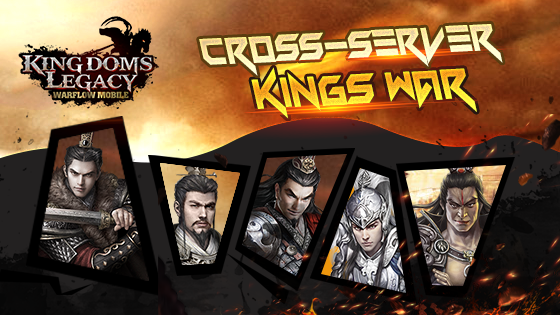 - The winner of the Final will become the Overlord of that Cross-server Kingss War Season. - Within Promotion, the winning side gains points, the losing side’s points won’t be deducted. Elimination: Rewards are settled based on point ranking and sent at 23:00 of ending day via mail (24th day every month). Promotion: Upon defeated, rewards will be sent to mail based on corresponding rank. Flower rewards: If the receiver wins, then the sender will get reward via mail.